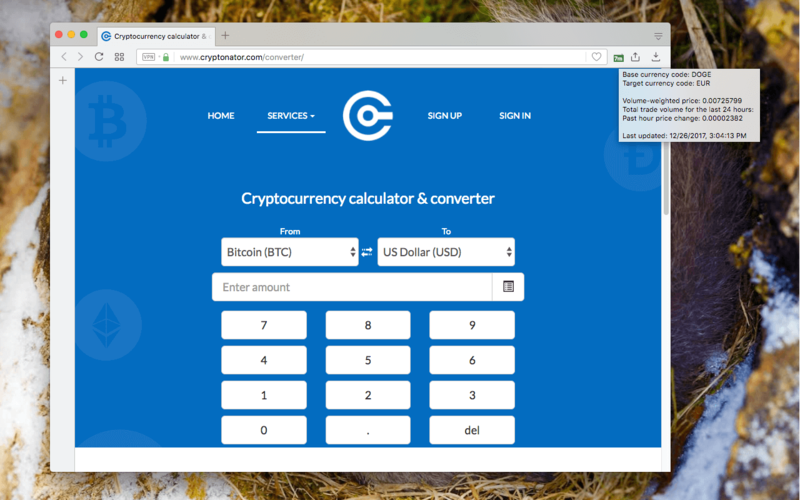 "Cryptocurrency Exchange Rate" extension adds a button to your browser toolbar area. Left-clicking on the button opens a user-defined cryptocurrency related website (this option is meant to access a trading website easily). Right-click has two options: 1) to open the online currency converter window and to update the badge number (current exchange rate). The badge text displays the current exchange rate either in green or red color which indicates whether the price is raised or dropped in the past hour. You can use the options page to control how the badge text is displayed and what currencies are to be converted. What is the "CryptoCurrency Exchange Rate" extension and how does it work? This extension aims to simplify cryptocurrency monitoring by automatically updating a user-defined exchange rate in the toolbar area. Use the options page to define what currencies are supposed to be converted (the default is ETH to USD). When the currencies are changed, make sure to play with the decimal value to fit the exchange rate in the available area. By default, the extension tries to convert the exchange value to a human-readable value (optional setting). What are the supported currencies by this extension? Most of the known digital currencies are supported (about 1370 currencies at the moment). If you need a new one that is not yet supported, please leave a feedback in the "Review" section. What is the meaning of the human-readable option on the options page? Readable format converts the exchange rate that is shown in the badge area to something that is easier to read. Examples: 1010 -> 1.01K or 0.00101 -> 1.01m. If this behavior is not preferable, go to the options page to disable this feature. What is the meaning of the decimals on the options page? This option controls the number of digits that appear after the decimal point in the badge area for the exchange rate. You need to fix this value each time a new currency pair is set to make sure the exchange value is fit in the available badge area. Can I change the badge color when the exchange price goes up or goes down? Yes, by default, the extension uses green-ish color when the exchange value is positive in an hour time window and uses a red-ish color when it is dropping. Both colors are customizable in the options page. What is the use of the left-click page? The left-click on the toolbar button is meant to open your preferred trading website. It provides an easy way to open the website when based on the badge exchange rate you would like to do a new trade.